The attractiveness of drystone walling stems from the natural variability of walling stone. Unlike brickwork or masonry, no two stones are alike – yet with care and experience it’s possible to create order out of chaos. 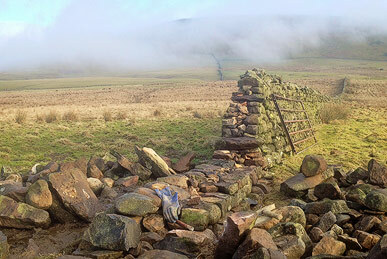 At Cumbria Stone Walling, I take pride in this unique construction method and the valuable role dry stone walls play in our cultural identity. 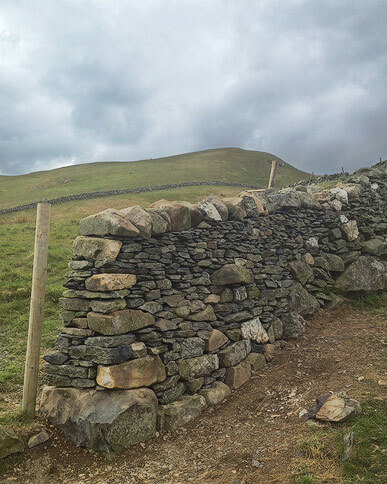 The skill of a drystone waller is to predict how a wall will move or settle over time, and select stones to minimise the consequences of that inevitable movement. Weight distribution is key, as a typical wall can exceed 1 tonne for every metre – putting immense pressure on the foundations. Almost every stone in a well constructed wall is positioned so as to divert the centre of gravity into the middle of the wall. 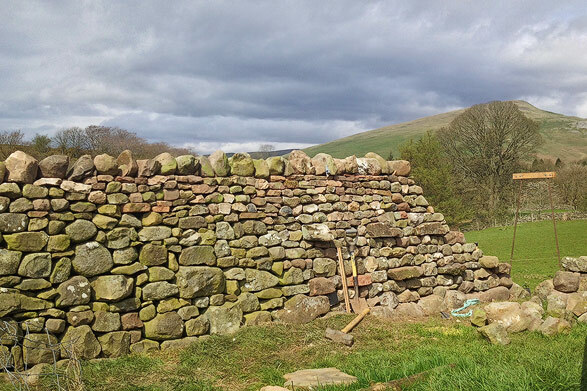 At Cumbria Stone Walling, I provide a wealth of experience in understanding the structural qualities and vernacular styles of stone walling here in Cumbria, and beyond. Much of my work involves repairing farm walls; I also undertake garden projects, often combining drystone and mortared construction. Mortar is typically needed for safety reasons or if the structure is small (the strength of drystone walling relies in part on the weight of stone above). In these situations I normally recommend a lime mortar, which is more flexible and can be made in differing strengths according to how exposed the structure is. Changing farming practices and the shift towards subsidies as the principal farm asset have put significant pressure on dry stone wall maintenance in recent decades. Unfortunately, if this situation continues, future generations will be faced with insurmountable lengths of wall to upkeep – threatening these iconic features of our most treasured landscapes. With this in mind, I’ve produced a short guide to dry stone walling repairs which owners of field and garden walls may find useful. It also provides links to sources of information which those commissioning work may find helpful when setting specifications or assessing work.